Aarhus’s time has come. It will be joint European Capital of Culture in 2017 along with Paphos, in Cyprus, and European Region of Gastronomy 2017 along with Riga-Gauja (Latvia) and East Lombardy (Italy). The docks are already being transformed by new cultural venues such as Dokk1 and the dramatic Iceberg housing development. Plus, the city is getting a reputation as the new kid on the Scandi gastronomic scene. 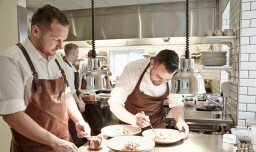 Last year, three restaurants, Frederikshøj, Substans and Gastromé, won the city’s first Michelin stars (awarded again this year) – only one star each, so they are not yet in Noma territory, but they are part of an exuberant food scene to suit all pockets. Gastromé, like the other two restaurants, is fanatical about local, seasonal produce and claims to bring the countryside to the city.